Stephen F. Austin State University elementary education students and volunteers kick off the third annual African-American Read-In at Brooks-Quinn-Jones Elementary School in Nacogdoches. Pictured, from left, are Carolyn Bugg, SFA senior; Michelle Bolton, Houston-area lawyer; Roy Boldon, mayor pro tem of Nacogdoches and member of Concerned Black Men; and Betty Sanders, BQJ librarian. NACOGDOCHES, Texas - Opening the book "Chocolate Me!" 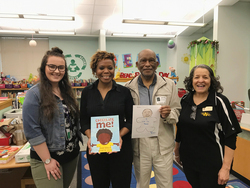 by Taye Diggs, Stephen F. Austin State University elementary education students and volunteers kick off the third annual African-American Read-In at Brooks-Quinn-Jones Elementary School in Nacogdoches. The read-in, which was established by the National Council of Teachers of English in 1990, promotes diversity in literature by highlighting African-American authors while also celebrating Black History Month. "This is always a great opportunity to introduce new books to students," said SFA Associate Professor Dr. Lauren Burrow, who has organized this event for the past two years. "This year, we read to approximately 140 students. This has always been a fabulous activity, and I am so grateful to Brooks-Quinn-Jones administrators and teachers for their support." SFA elementary education students read several books by African-American authors and organized activities related to each book. Activities included coloring self-portraits with multicultural crayons to better represent each student's unique skin tone, writing about what makes students feel royal and reader's theaters, which was an avenue for students to discuss what gives them the blues. For more information about SFA's Department of Elementary Education, visit sfasu.edu/elementaryed.